Following Andrew Cuomo’s decision to disband a corruption commission he created, Morning Joe hit the New York governor hard for his questionable tactics. The scandal comes after The New York Times reported that Cuomo shut down the commission when it began to go after some of the Governor’s own political allies. It is an interesting quote considering that it's the taxpayers of New York State that funded that commission and unless Andrew Cuomo funded that commission and took care of all the expenses for it, I think he is very confused. It is not his commission any more than it's his governor's mansion, any more than it's his state. Because if this level of facts existed about say, a Chris Christie, this would be on the network evening newscasts every night. It’s a huge controversy, a huge scandal. Maybe he'll talk about it today but I don't know how he explains the things they are admitting to. He is spinning them. But the facts as already known are just horrible. While Morning Joe gave this story some much needed attention, other media outlets have been very quiet on the story. CNN’s New Day – co-hosted by the Governor’s brother Chris Cuomo – has not reported on the scandal since the story broke late last week. The relevant portion of the transcript is below. MIKA BRZEZINSKI, co-host: New York governor and possible presidential candidate Andrew Cuomo is taking flak for creating a commission to investigate political corruption, and then disbanding it after it hit too close to home. Cuomo set up the commission a year ago which he touted as having the best minds in law enforcement to try and to root out corruption and to restore public trust. CUOMO: It's not about a witch hunt. It's clear there are cases that need to be policed. I mean, that's inarguable at this point. Why we are doing this and the need to do this is totally clear to anyone who has been living in this state. 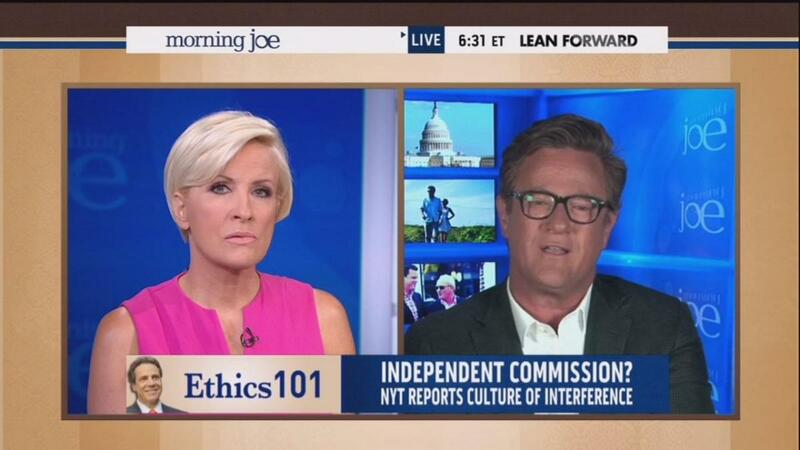 BRZEZINSKI: He even campaigned on this saying the commission would be independent. CUOMO: So I am appointing a new independent commission, led by top law enforcement officials from all across this great state, to investigate and prosecute wrongdoing. BRZEZINSKI: But The New York Times reports it was stifled nearly from the outset by the governor's own aides. Especially when the Governor’s interests were in the crosshairs. In one case the commission investigated a media buying firm whose client was none other than the Governor. When Cuomo's office found out the firm was being subpoenaed, The Times reports, a top staffer called one of the co-chairs of the commission and told him to take it back and the commission did. Now a federal prosecutor says he won't rule out investigating the Governor but in an interview with Crain’s, Cuomo said his office's handling of the commission wouldn't be the subject of a probe because quote it's not a legal question. The Moreland Commission was my commission, it's my commission, my subpoena power, my Moreland Commission. I can appoint it, I can disband it. I can appoint you, I can un-appoint you tomorrow. SCARBOROUGH: It is an interesting quote considering that it's the taxpayers of New York State that funded that commission and unless Andrew Cuomo funded that commission and took care of all the expenses for it, I think he is very confused. It is not his commission any more than it's his governor's mansion, any more than it's his state. SCARBOROUGH: ,I think someone may be deluding themselves at this point, and this is really, as The New York Times story showed, deeply troubling. SCARBOROUGH: Mark Halperin, I'm stunned in 2014 at how ham-fisted this is by the governor of one of the largest states from a political family. You set up a commission, you campaigned on the commission and then when they ask questions about some of your people, you actually shut the commission down and then you say it's my commission. This is straight out of Louisiana. This is Huey Long material. Are you stunned that Andrew Cuomo's judgment is this bad in 2014? Has he really been that bubble wrapped over the past three years that he thinks he is above questions from The New York Times and other news organizations about this? MARK HALPERIN, Morning Joe contributor: I'm not stunned because this is largely the way his office has operated, known to insiders in Albany – Albany is a black hole of political coverage and I think he thought he could get away with this as his office has gotten away with other attempts to intimidate the press, intimidate political people in both parties. And he has miscalculated here. I think the worst news for him in some ways besides the U.S. attorney investigation is, this suggests people don’t take him all that seriously as a national figure. Because if this level of facts existed about say, a Chris Christie, this would be on the network evening newscasts every night. It’s a huge controversy, a huge scandal. Maybe he'll talk about it today but I don't know how he explains the things they are admitting to. He is spinning them. But the facts as already known are just horrible. Not because he ran on it. Because of the underlying things they did to protect himself and his political allies. SCARBOROUGH: Mika, I can't help but follow up on what Mark said regarding Chris Christie. SCARBOROUGH: The difference between shutting down a couple of lanes which, of course, was a terrible thing to do whoever did it, and setting up an ethics commission that you campaign on, that you fund, and then you shut down when it begins investigating you and then again most stunningly your response is it's my commission, I set it up, I can shut it down. Again, I find it hard to believe that Andrew Cuomo has been this bubble wrapped in Albany that he would be that ham-fisted. BRZEZINSKI: Well, you know, and that quote seems like a blink to me because it's inarticulate and almost babbling. I don't know what it sounded like, but does that make sense? It's like I can un-appoint you. It sounded like he has nowhere to go. Connor Williams is a contributing writer for NewsBusters.